T/O Witchford 0027 - target Chevreuse, France. 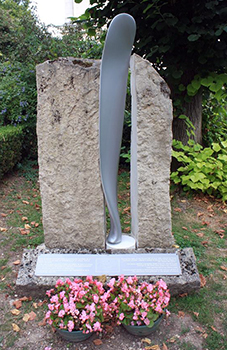 Shot down by a night fighter and crashed into a field 200 yards from a road leading to Vernon,a small town 38 Km SE of Rouen. The target was a major road bridge in Paris between Massy and Palaiseau. Its destruction would seriously hamper the movement of reinforcements to the invasion Front. 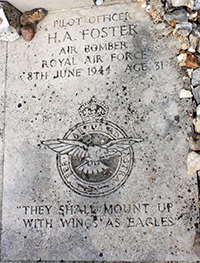 To avoid loss of French cicilian life orders were to wait for the Master Bomber to verify that the markers were correct before bombing took place. 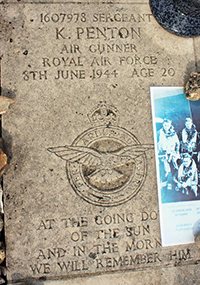 There was thick ground haze and the Master Bomber went u/s. The deputy took some time to get it all together and in the meantime the force of 337 bombers sent to various targets around Paris waited. It was a clear night and the night fighters descended. 337 aircraft - 195 Halifaxes, 122 Lancasters, 20 Mosquitos. Attacks railway targets at Achères, Juvisy, Massey Palaiseau and Versailles. Bombing conditions were better than on the previous night. All targets were accurately bombed and, although no details are available, it is probable that fewer civilians were killed. The targets were mostly more distant from the battle front than those recently attacked and German night fighters had more time to intercept the bomber forces. 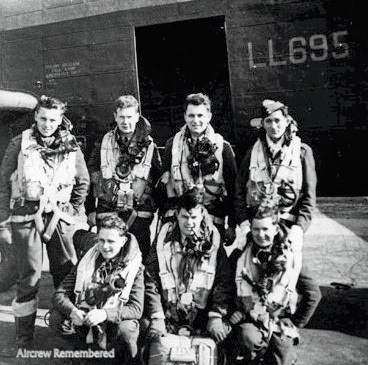 17 Lancasters and 11 Halifaxes were lost, 8.3 per cent of the forces involved. 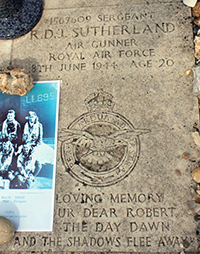 Source: nationalarchives.gov.uk - Bomber Command - Campaign Diary June 1944. In the background 115 Squadron Lancaster LL695. She was delivered to 514 Squadron on 10 April 1944. Lost on the Duisburg raid, 21/22 May 1944, 3 KIA, 2 POW, 2 EVA. 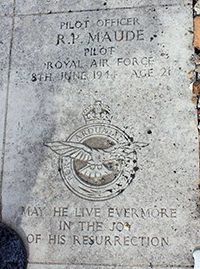 Son of Edgar Ringrose Maude and Elsie Boyfield Maude, of Gloucester. 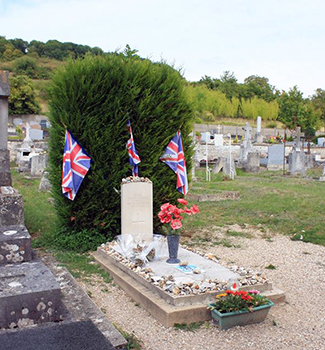 Giverny Churchyard, Departement Eure, France - collective grave. 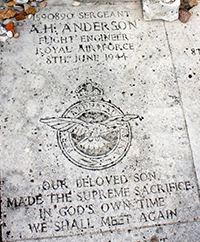 Son of Herbert and Florence Hilda Anderson, of North Shields, Northumberland. Source: CWGC - photo via Thierry Grier. 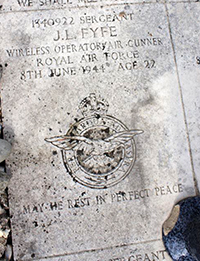 Son of William and Isabella Leslie Fyfe, of Tillicoultry, Clackmannanshire. Son of Arthur and Alice Lily Foster. 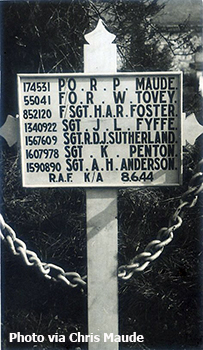 Husband of Joan Rosamund Foster, of Coventry. Son of Charles and Evelyn Penton, of Southampton. Son of John Macpherson Sutherland and Helen Sutherland, of Golspie, Sutherlandshire.